You use numerous guitar effects, and you need a device to commute them with a true bypass? You want to be able to switch on and off several of them with the push of just one button? And you want the programming to be quick and simple? Then N-audio 12 channel programmable true bypass effects looper is your choice! 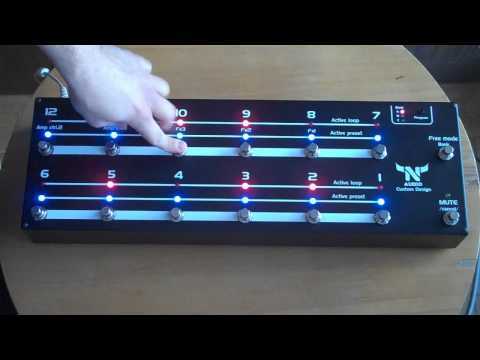 N-audio 12-channel programmable true bypass effects looper is a floor-based switching system for musicians. It is based on a microcontroller with а built-in flash memory, which can store user-defined presets. Switching is implemented with the help of relays, which allow for true bypass switching on the way of the signal from the passive input to the amp-out output. This looper allows for switching up to 36 user-defined presets using up to 10 different guitar effects from the effect chain and 2 amplifier controls. This new 12 channel looper has Free mode feature. This great feature is a useful functional option which allows you to remove or add effects to a previously programmed preset. N-audio can make your custom 12 channel programmable true bypass looper. For more information, please contact us. Usually we ship our 12-channel programmable looper within 1-2 days. The time for delivery to Europe is 4-10 days, 2-4 weeks for worldwide delivery via post /registered priority mail/ and 3-6 days for worldwide delivery via EMS. We accept almost any type of payment: Bank transfer, MoneyGram, Western Union etc. Also you can buy directly from our site via Paypal, but if you like to choose your preferred payment method, please contact us. We will try to comply with your request. Copyright by N-audio. All rights reserved.